It may sound strange, but these days I actually look forward to Monday. Why? Because a new food truck visits the UMB campus that day. Souper Freak, as you can probably tell by the name, specializes in soup, offering four or so varieties every day, plus sandwiches, salads, and snacks. While it might seem a little warm for soup right now, those of us in over-air-conditioned offices appreciate something that can take the chill off of the afternoon. That said, the Souper Freak serves a mean gazpacho. 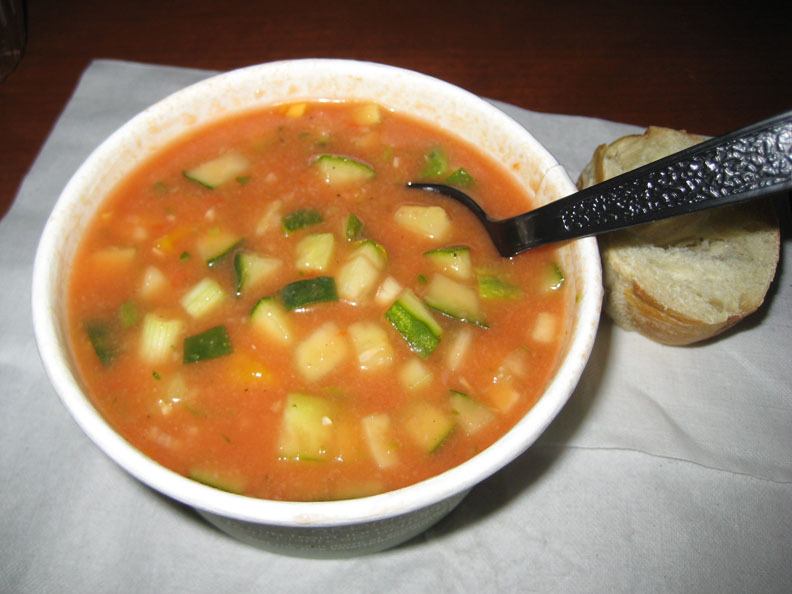 The soup was thinner than I usually prefer, but it had a well-seasoned tomato broth full of chunks of cucumber and multi-colored pepper. It was spicy, but not too, sweet, but not overly, and had just the right zing of vinegar. Really, really good. Oh, and a "cup" size is pretty huge - 12 oz - and quite the bargain for a mere $4. Ok, so it's a dollar more than that container of Campbell's you've brought for your lunch today, but SO MUCH BETTER and FRESHER. 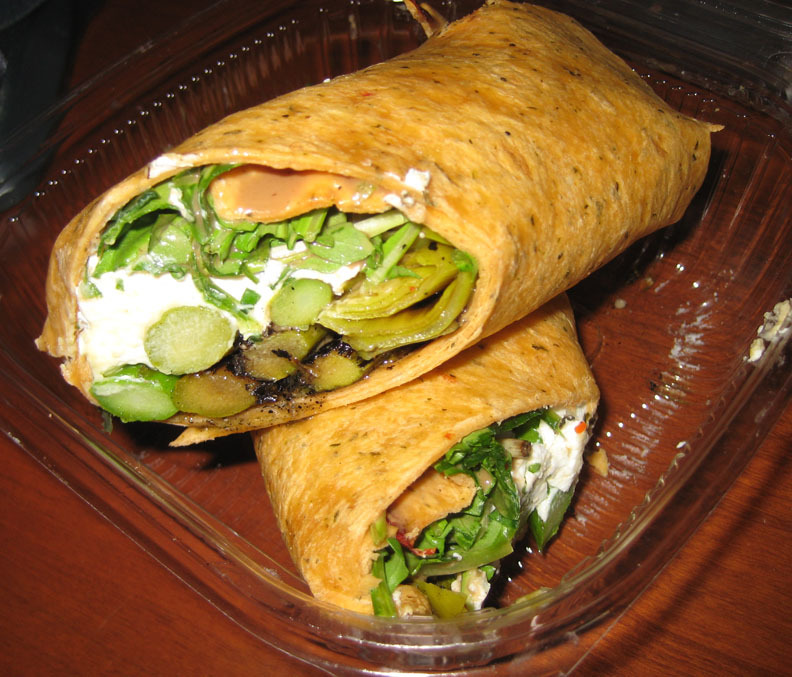 I also tried the asparagus and goat cheese wrap, which had more complex flavors than one might imagine: perfectly cooked, crisp, asparagus with a lovely, smoky, grilled flavor; creamy smooth goat cheese; and grilled onion, peppery arugula, and a balsamic vinaigrette. The combination of the gazpacho and sandwich was pretty much my idea of a perfect lunch, one I'd be happy eating at least once a week. Souper Freak's menu changes regularly though, so I have to settle for a different delicious combo every week. For example, the following Monday, I had a Greek wrap with roasted peppers, eggplant, olive tapanade, spinach, and feta AND a Greek Watermelon salad with watermelon, olives, mint and feta. (Yes, I love feta. And olives.) 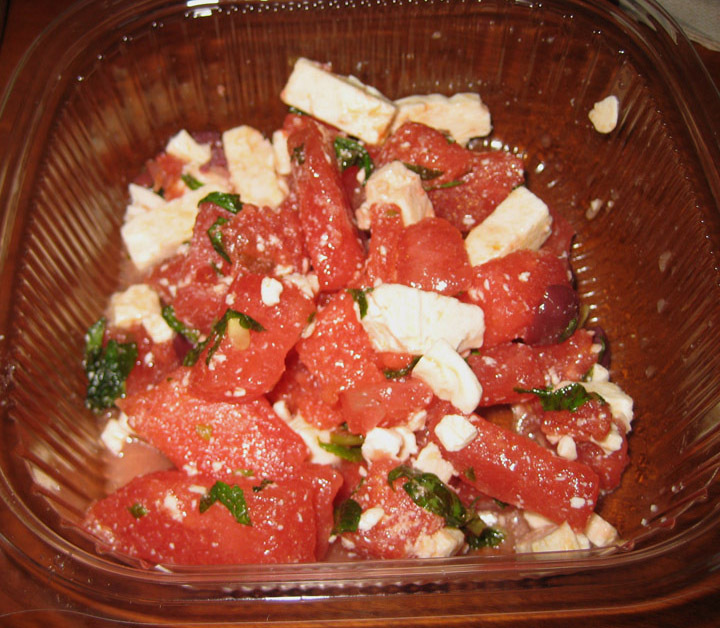 I make a watermelon and feta salad on occasion, and from now on I will be adding mint and kalamata olives because they work so well with the sweetness of the melon. 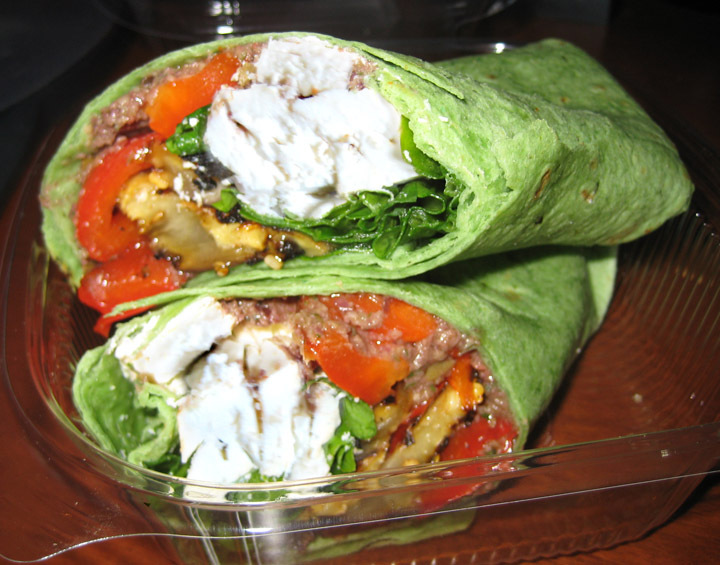 And I loved that I could get a sandwich with eggplant on it - such an underused vegetable that makes a perfect, almost-meaty, sandwich filling, especially with roasted peppers. Souper Freak usually has a vegan selection, plus a couple that are vegetarian (I realize duh! everything I've mentioned fits into that category, but they do have meat items as well), so there's something for everyone. And everything I've tried has been lovely, so I heartily recommend that if you see the truck in your area you should grab some lunch or a snack.